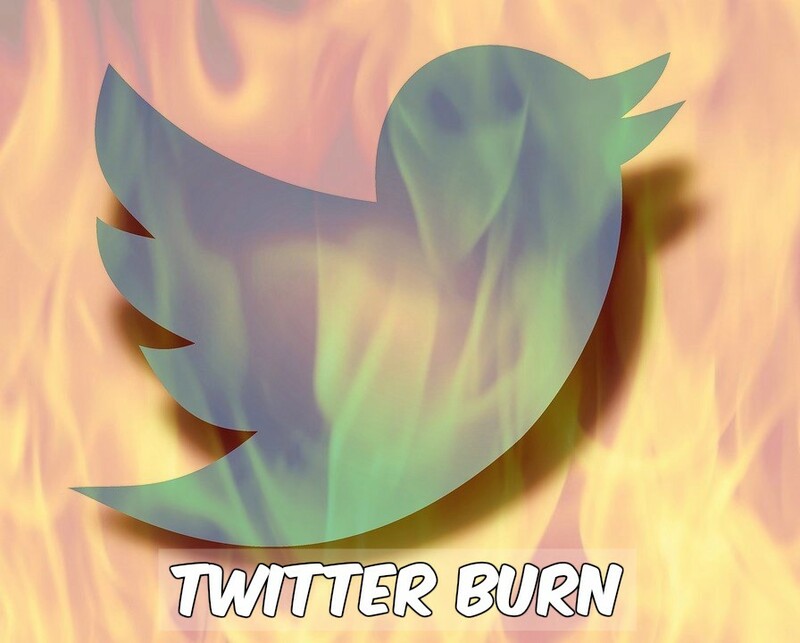 There’s been an awful lot of activity on a certain person’s Twitter account over the past week. I dunno … something about … Russia, I think? He of the thin skin just can’t seem to accept that not everyone worships him, which is why it seems he’s becoming more unhinged by the day. I’d laugh about that, but this is our country he’s screwing with. 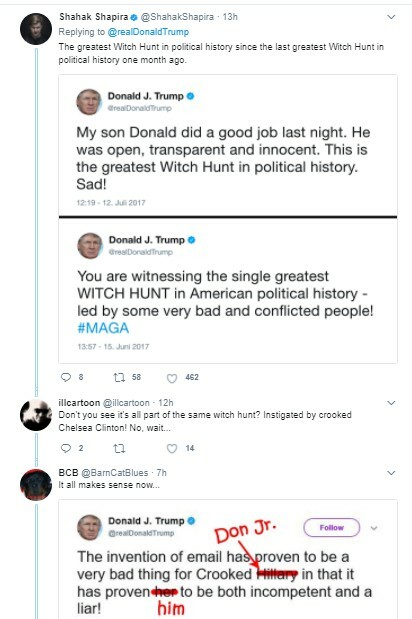 I can at least laugh at these burns. 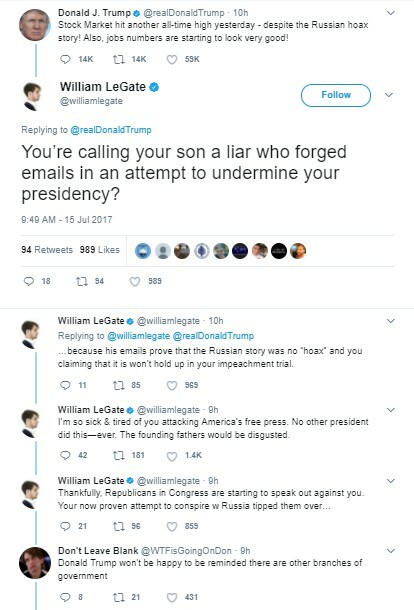 Screenshot from William LeGate’s Twitter page. Did somebody say hoax? Which one was it? Russia? The wall? 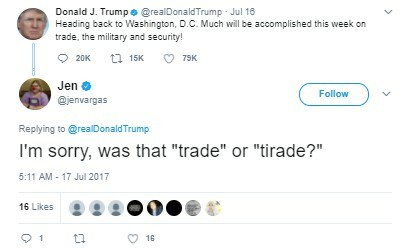 His presidency? 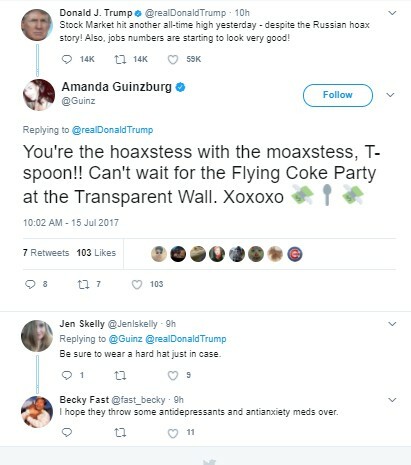 Screenshot from Amanda Guinzburg’s Twitter page. You can hear it too? Thank God! 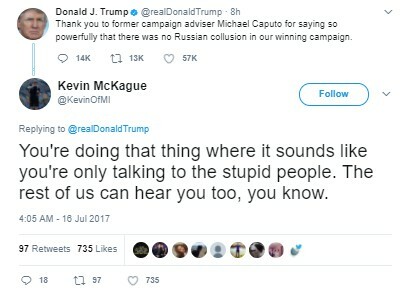 Screenshot from Kevin McKague’s Twitter page. The dog is an unimpeachable witness! 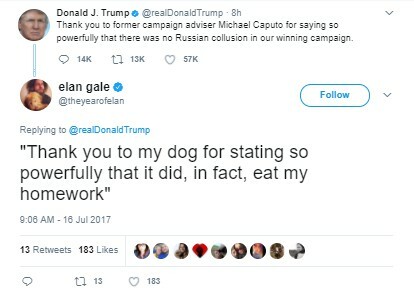 Screenshot from Elan Gale’s Twitter page. Never question Russians’ love for Daddy Vlad! 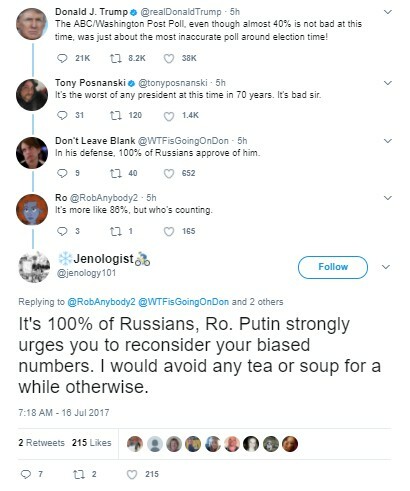 Screenshot from Jenologist’s Twitter page. But he understands chocolate cake and two scoops of ice cream, Steak, not so much. 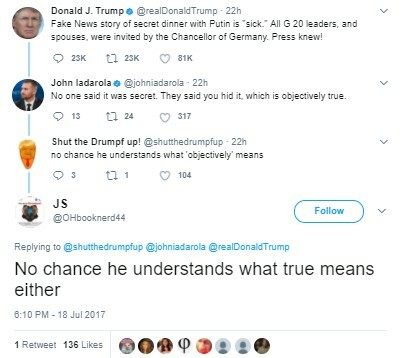 Screenshot from JS’ Twitter page. 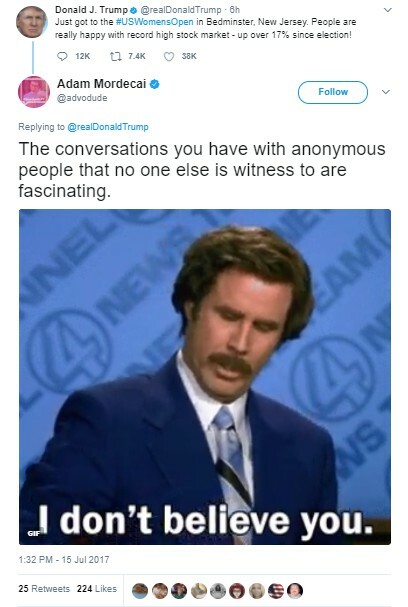 Screenshot from Trump’s Twitter page. But if she had turned him into Newt Gingrich, there would be no getting better. 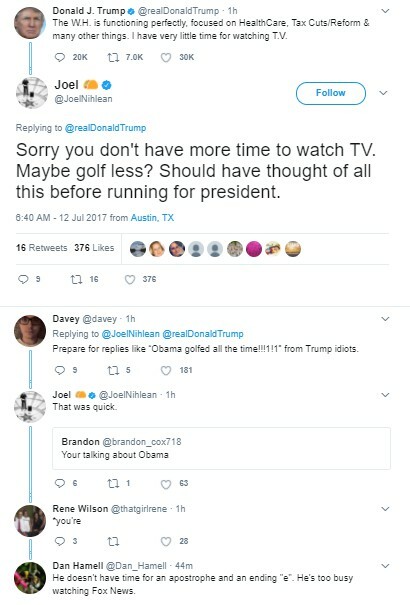 Screenshot from John Iadarola’s Twitter page. 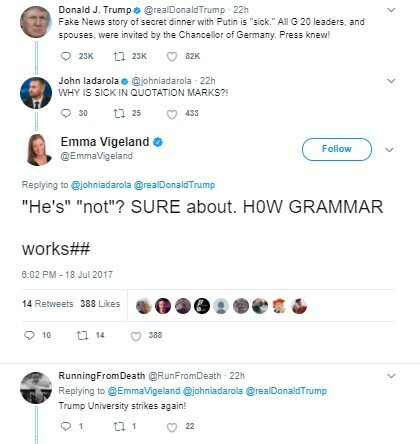 Screenshot from Emma Vigeland’s Twitter page. I mean, really, why is this important? Look at my highlights! 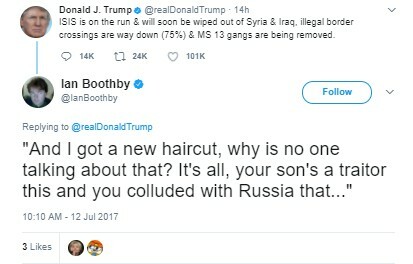 Screenshot from Ian Boothby’s Twitter page. 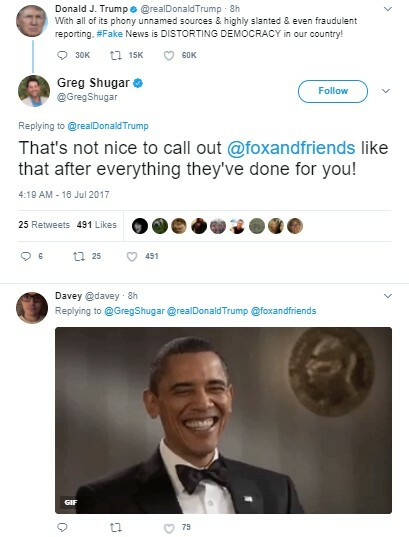 Screenshot from Greg Shugar’s Twitter page. 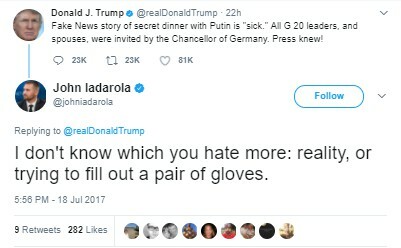 What does he not hate? Himself. 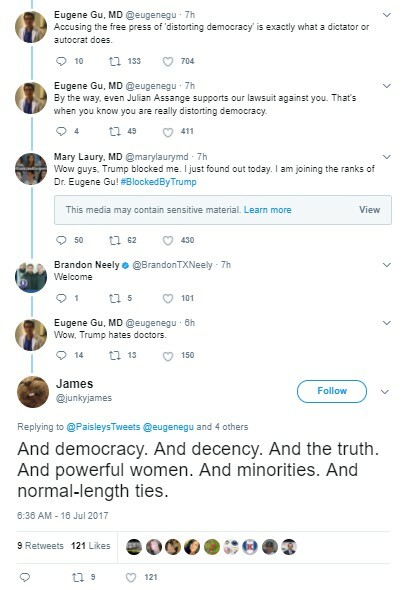 Screenshot from James’ Twitter page. 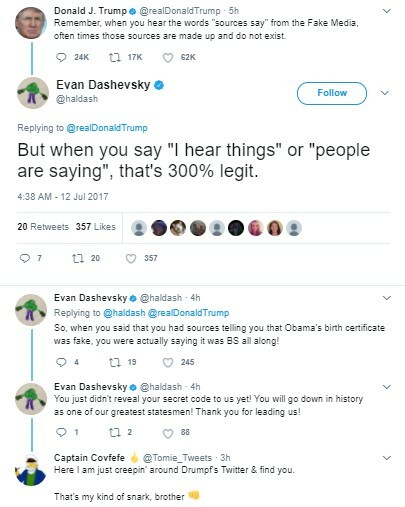 Screenshot from Evan Dashevsky’s Twitter page. 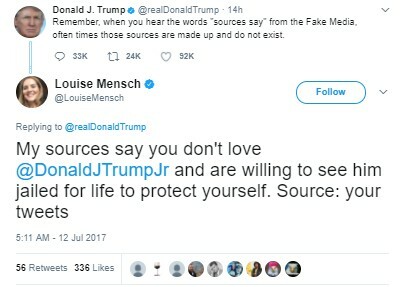 Screenshot from Louise Mensch’s Twitter page. 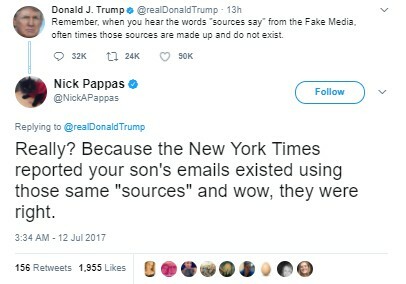 Screenshot from Nick Pappas’ Twitter page. I’m sure he’s broken both statues and statutes. 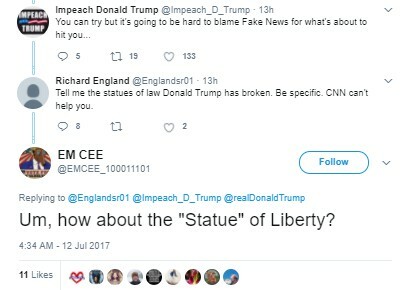 Screenshot from EM CEE’s Twitter page. Because apparently we’re gluttons for punishment. And deeply, deeply stupid. 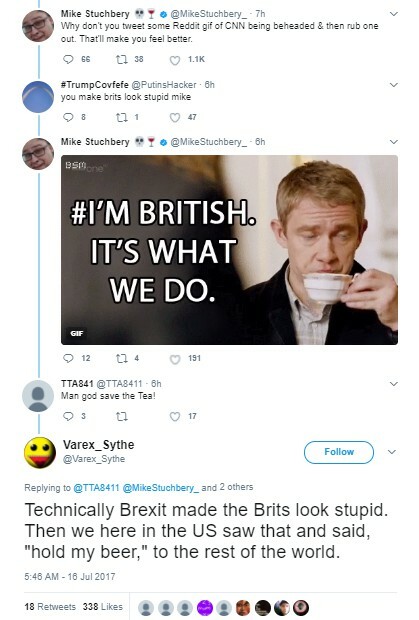 Screenshot from Varex_Sythe’s Twitter page. But she did it!!! It’s not fair!!! Ima hold my breath now. 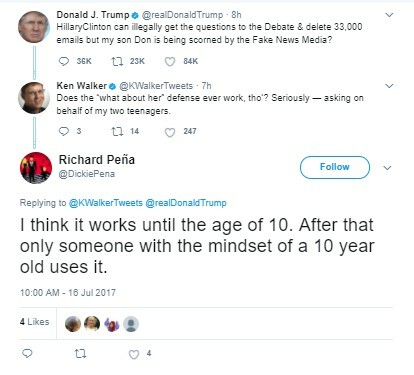 Screenshot from Richard Pena’s Twitter page. 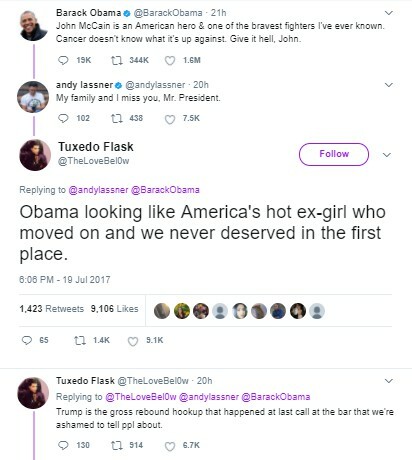 But see, Obama wasn’t Trump, and Trump is a god. 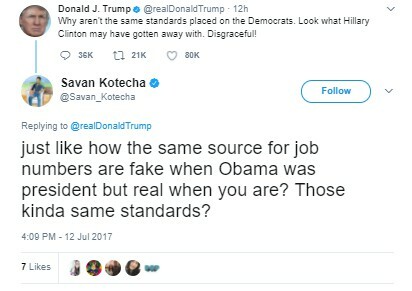 Screenshot from Savan Kotecha’s Twitter page. Yep, it’s truly astounding how quickly those numbers went from 40+ percent to 4.5! 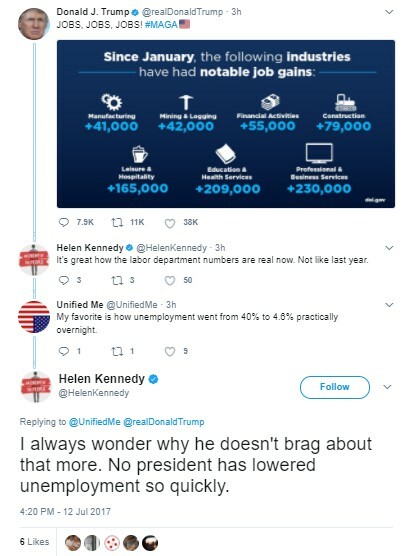 Screenshot from Helen Kennedy’s Twitter page. 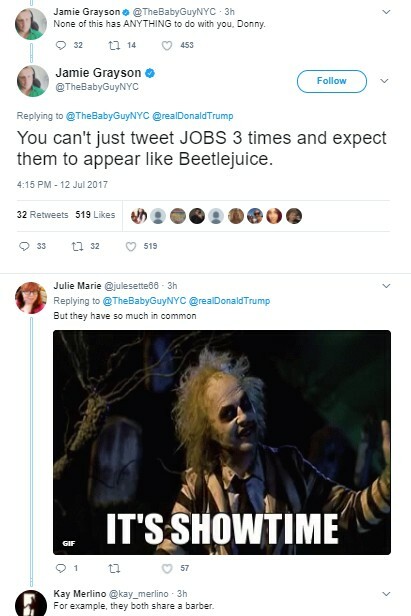 Beetlejuice is easier to stomach. Screenshot from Jamie Grayson’s Twitter page. He’s got to be the sorest winner in the history of the world. 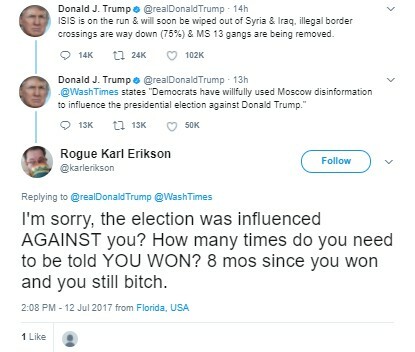 Screenshot from Rogue Karl Erickson’s Twitter page. All those people MUST be wrong, clearly. 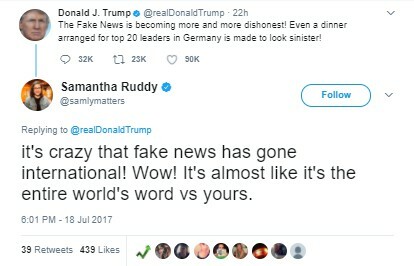 Screenshot from Samantha Ruddy’s Twitter page. It’s called diplomacy, ya douche. Screenshot from Ikava Nainen’s Twitter page. Screenshot from Adam Mordecai’s Twitter page. Even in the background, those hands look bigger than his … and some are indeed flipping birds. 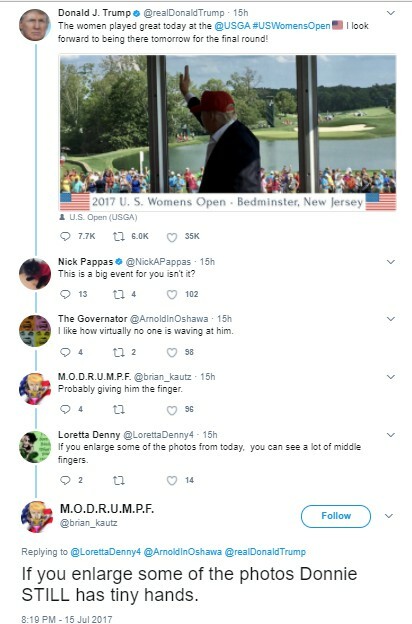 Screenshot from M.O.D.R.U.M.P.F.’s Twitter page. 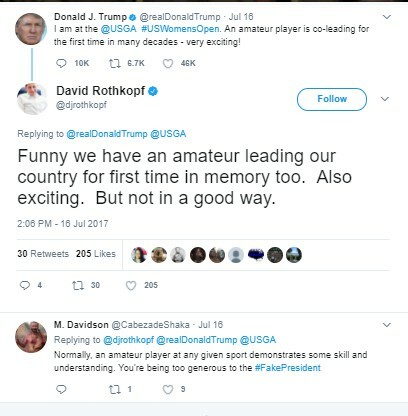 Screenshot from David Rothkopf’s Twitter page. Not that he really needs more, but thanks for saying he shouldn’t look into your finances! 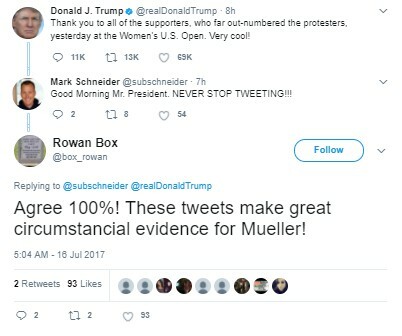 Screenshot from Rowan Box’s Twitter page. You understand our confusion, right? 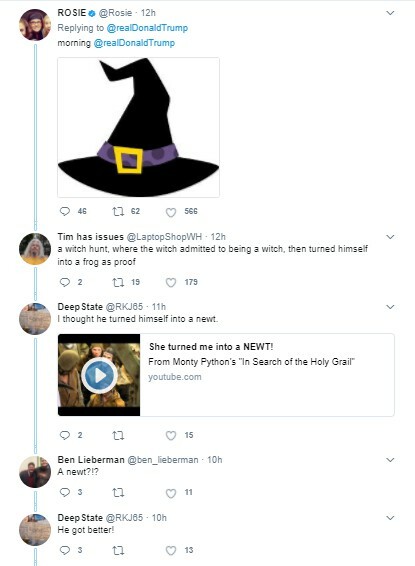 Screenshot from Jen’s Twitter page. Yeah, because it looks like most of it’s made in China or Mexico. 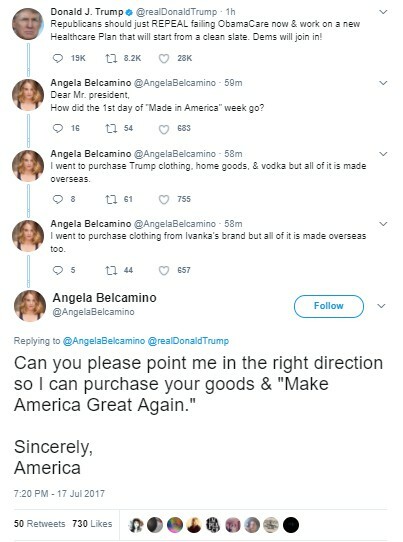 Screenshot from Angela Belcamino’s Twitter page. Dang it, and I just got that song out of my head! 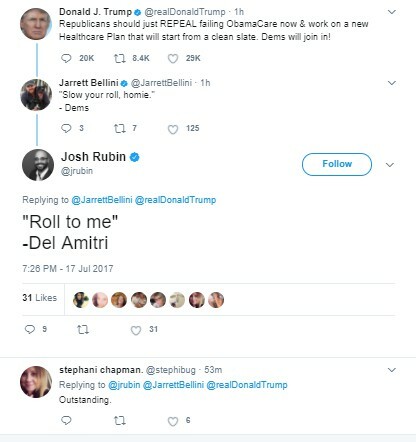 Screenshot from Josh Rubin’s Twitter page. Maybe you didn’t wish hard enough. 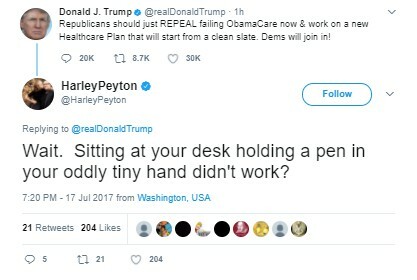 Screenshot from Harley Peyton’s Twitter page. I call a do-over! I’m the president, dammit! 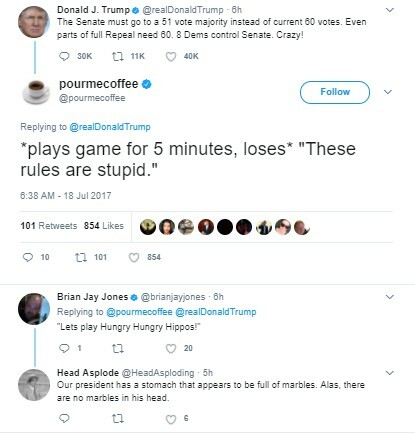 Screenshot from pourmecoffee’s Twitter page. The answer is 42. It’s always 42. 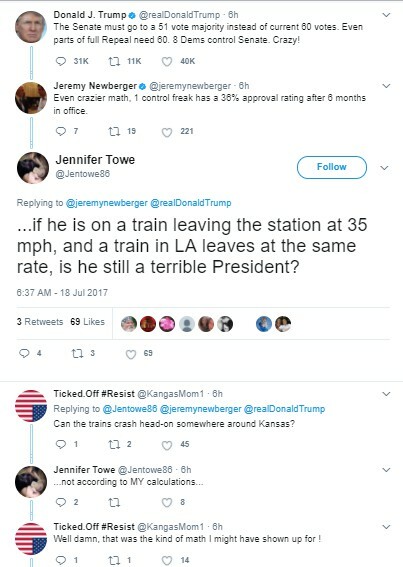 Screenshot from Jennifer Towe’s Twitter page. 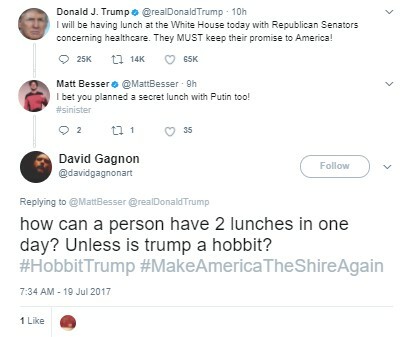 Screenshot from David Gagnon’s Twitter page. 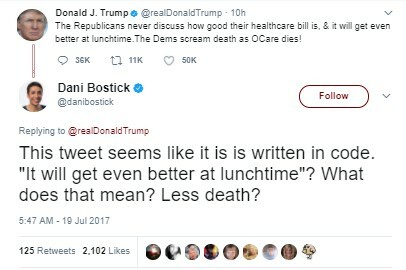 Screenshot from Dani Bostick’s Twitter page. Indeed, and mental health care is gonna be iffy too. He prefers ’em crazy. 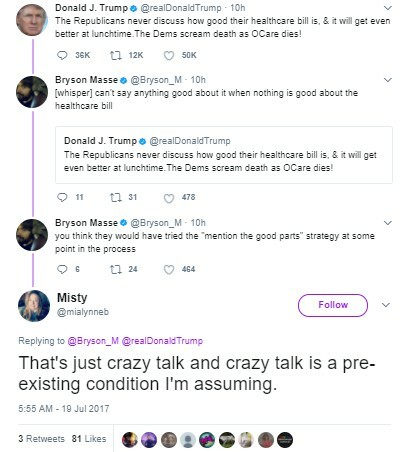 Screenshot from Misty’s Twitter page. 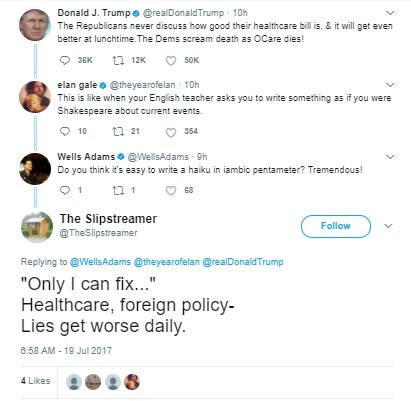 Screenshot from The Slipstreamer’s Twitter page. Ask your doctor if Trump is right for you! 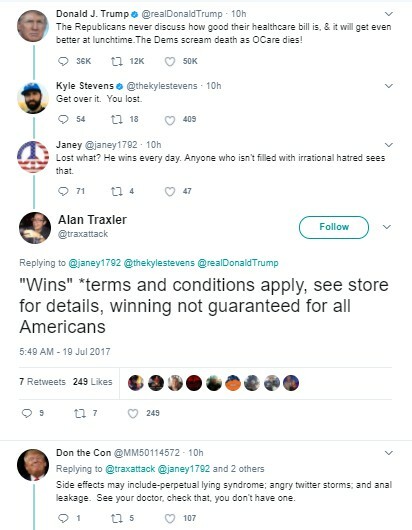 Screenshot from Alan Traxler’s Twitter page. No … liberals are big meanies! 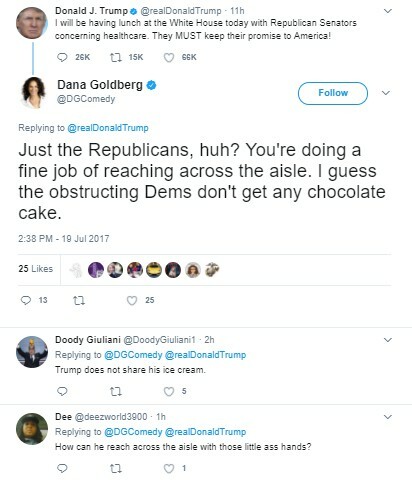 Screenshot from Dana Goldberg’s Twitter page. I … I got nothin’. Where can you go after “meat popsicle”? 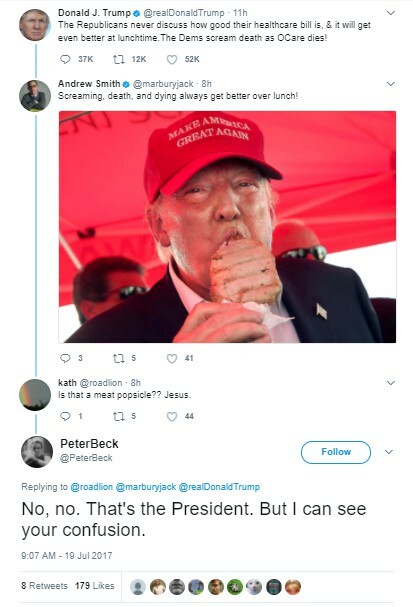 Screenshot from Peter Beck’s Twitter page. “Flying facelift” is my favorite way of not cursing this week. 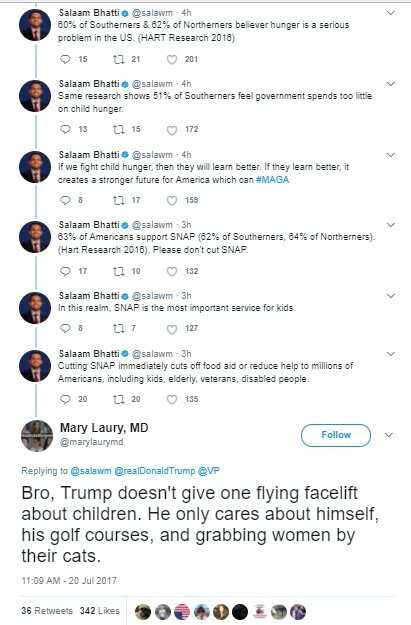 Screenshot from Mary Laury, MD’s Twitter page. If only he hadn’t seen that thing about him watching so much TV on TV. 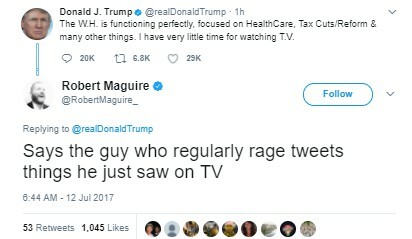 Screenshot from Robert Maguire’s Twitter page. For managing to work in Kathy Bates, I salute you! 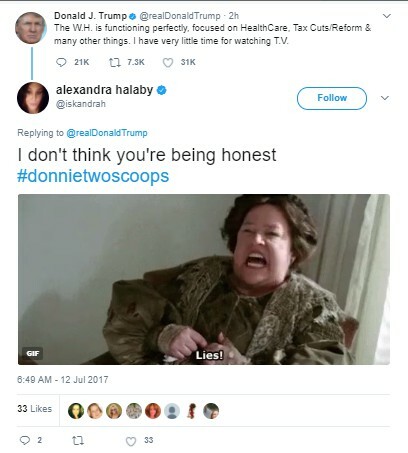 Screenshot from Alexandra Halaby’s Twitter page. Dude, you should chill and watch The Walking Dead. I hear it’s the story of your administration. 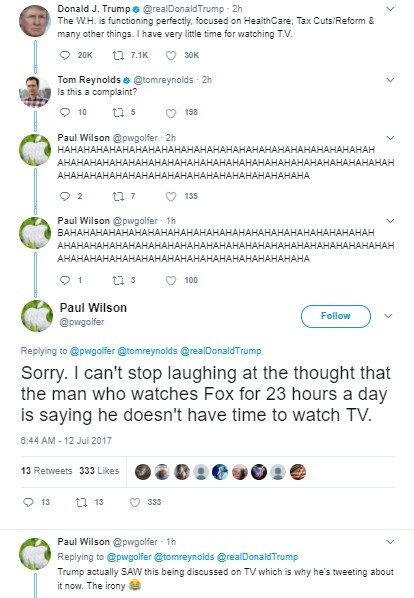 Screenshot from Paul Wilson’s Twitter page. Yeah, presidenting is hard work. Screenshot from Joel’s Twitter page. Especially since it’s that nasally thing you do when you’re upset. 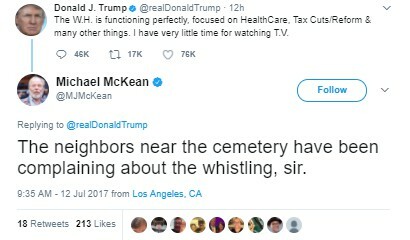 Screenshot from Michael McKean’s Twitter page. No Fox & Friends? I surrender! 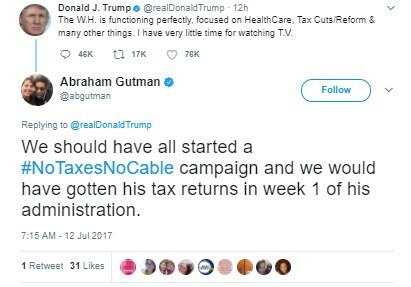 Screenshot from Abraham Gutman’s Twitter page. 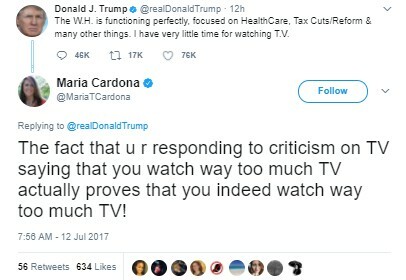 Screenshot from Maria Cardona’s Twitter page. 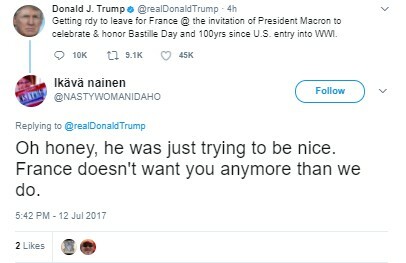 Finally, while someone belatedly tweeted that John McCain should “get well soon” (because apparently glioblastoma is just like having the flu), others, including our most recent former president, tweeted more profound thoughts, reminding some what diplomacy and graciousness are all about. I miss this. Screenshot from Tuxedo Flask’s Twitter page.